Well the deadline for Challenge #7 is upon me and I have managed to complete quite a few things this week. 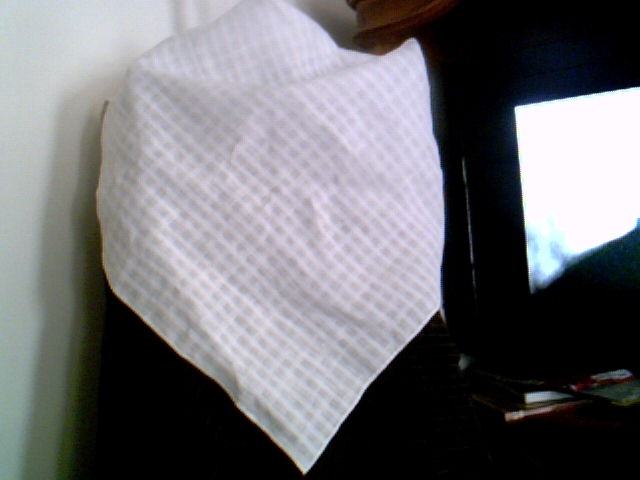 I finished up two triangular handkerchiefs last night and 2 aprons today. 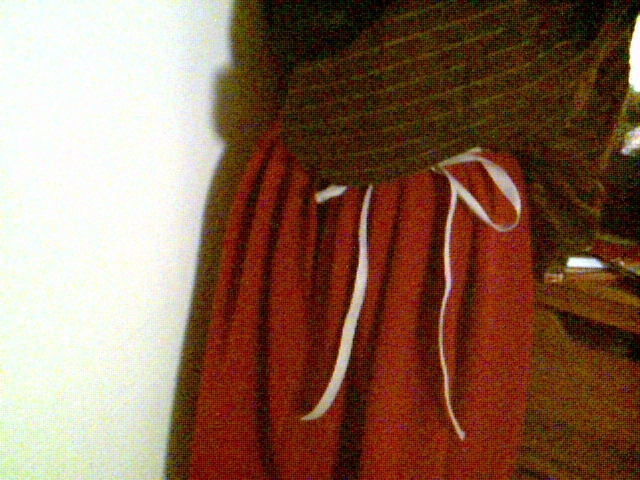 The last three pocket hoops need their canes and the waistbands finished but that should be finished by tonight. 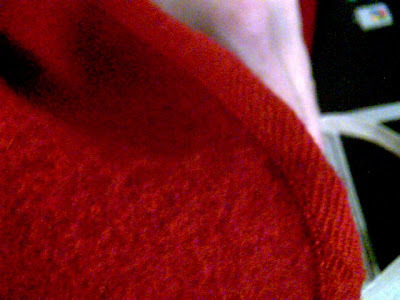 Handerkerchief draped on me, just to show it off, obviously not in costume. 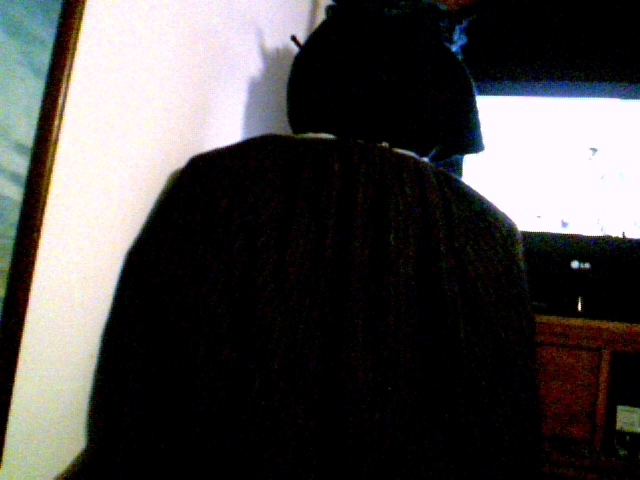 Back view, still stuck with the pitiful webcam so I can't get a full view and good focus at the same time. Coat rack is still doing duty as the display dummy. Yes, I did take breaks to read and give my eyes a break from all the white. and I had to go back and fix it. Always have to monogram, especially when I use the same fabric for family members. 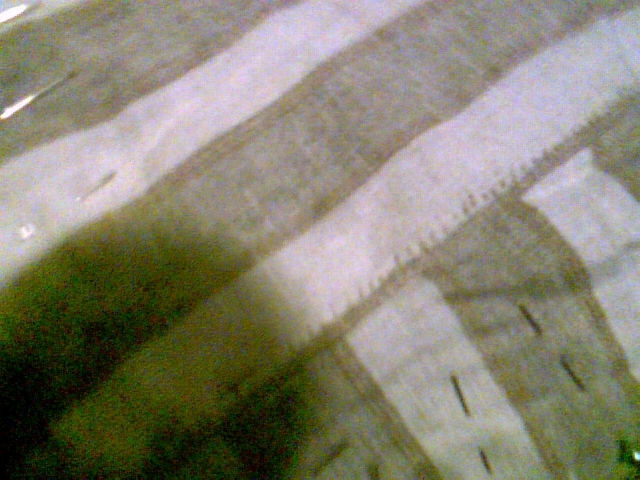 Fabric: 1 yard 100% linen, 60 inches wide, 1/4" check is formed by alternating groups of medium and fine threads, at different epi (ends per inch). This produces a semi-sheer cloth with intersecting more compactly woven stripes in the warp and weft. 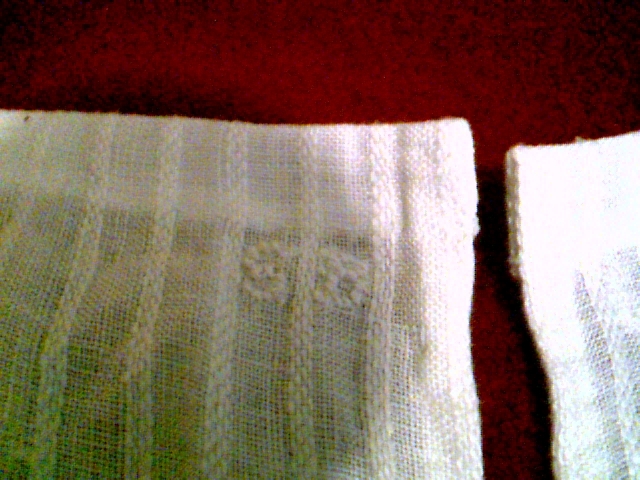 Similar fabrics were called dorea and dimity in the 18th century. 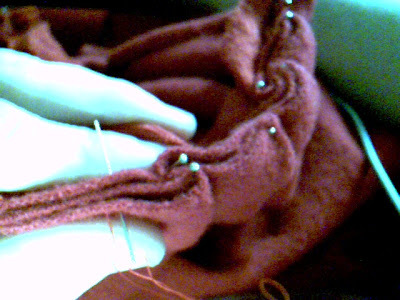 The extra width of the fabric will be used for the backs of Lynn and Shannon's pockets. Pattern: Triangle formed by diagonally folding a 36" x 36" square and cutting the diagonal. 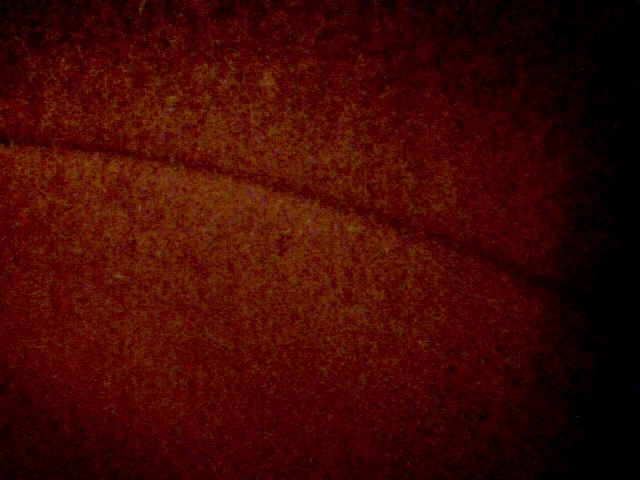 Slit of about 1 1/2" at center of neck edge. 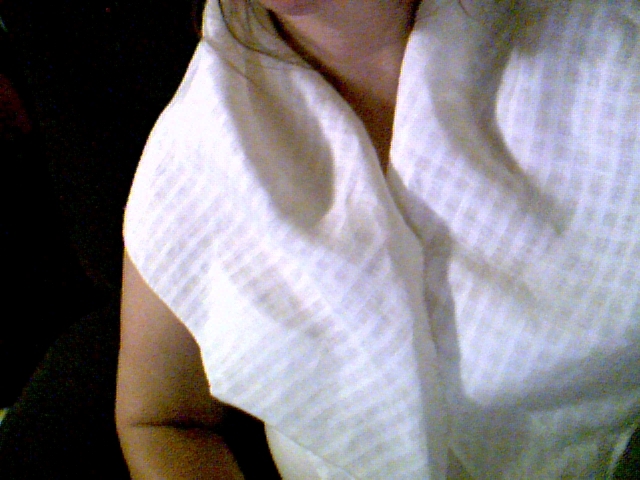 This allows the handkerchief to lay smoother around the neck. 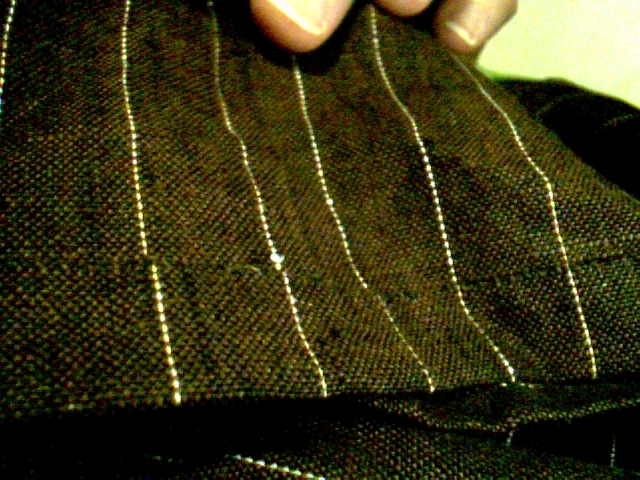 Sometimes small tucks were made, pinned or basted in place, in place of or in conjunction with this slit to aid in the fit. 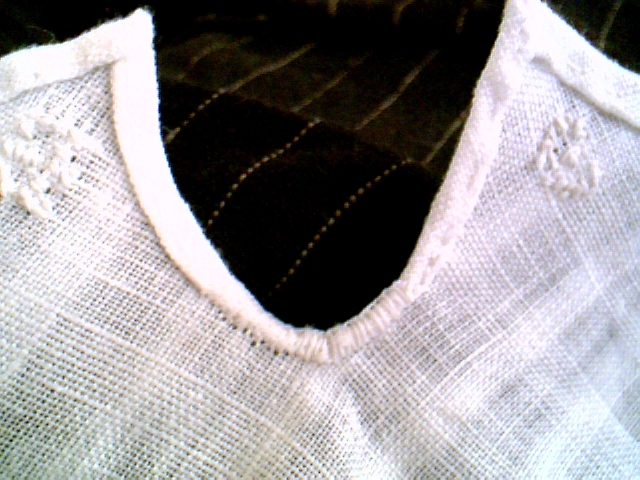 Curved neck edges were also used in the period. Year: 1770s, this shape was used throughout the century and into the next. 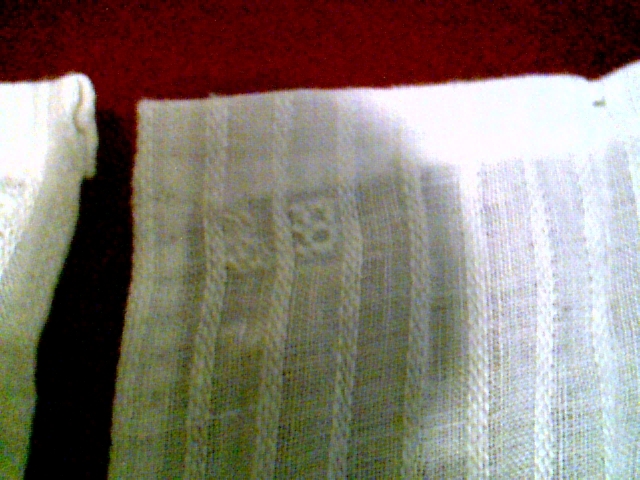 Notions: 60/2 white linen thread, used single strand for hemming and doubled for monograms. How historically accurate is it? 10/10. The fabric is woven in the same manner used in the 18th century. Size and material of the handkerchiefs is in line with common widths for the period, as evidenced by period advertisements in the New England area (most particularly, the Newport [RI] Mercury). Handkerchiefs could be square (doubled on the diagonal) or triangular. 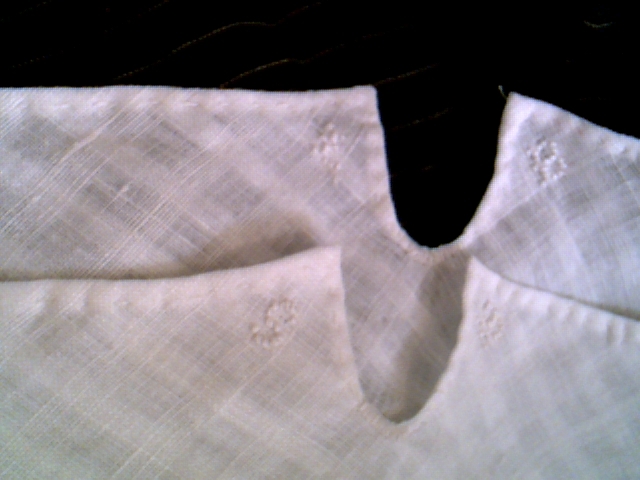 Triangular handkerchiefs could have straight or curved neck edges, with or without center slit, with or without fitting tucks. 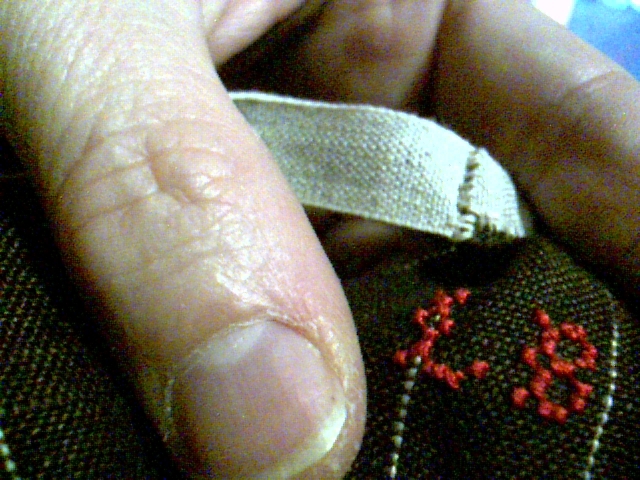 1/8th inch wide hems are stitched using linen thread and the running back-stitch, with the bottom of the slit reinforced with a row of back-stitch and blanket stitch to cover. 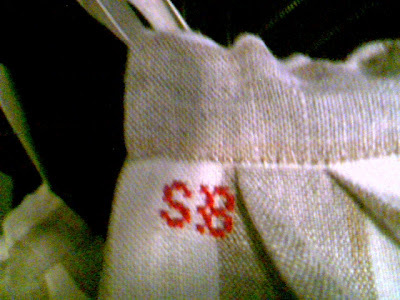 Monograms are cross-stitched using two strands of matching linen thread (so they don't show through, but can be seen to use for identification) and use the alphabet used in the Coggeshall samplers. Hours to complete: about 8 hours for both (I'm not counting the time to correct my mistake on one monogram, or the time it took to run over to Coy's house (four blocks away) to do the pressing to get an accurate cut line for the neck edge, also not counting time spent reading.). 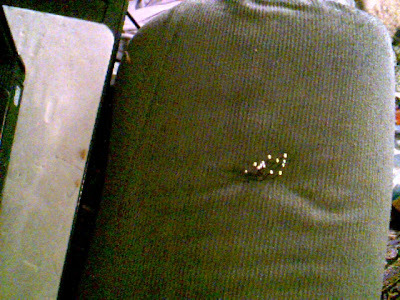 Our iron died a really messy (and rusty) death, all over the new ironing board cover. Thankfully, I didn't have the linen on the board yet. 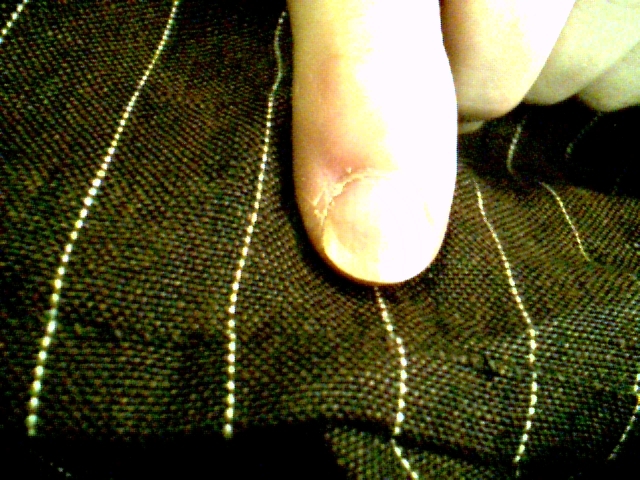 I've learned through experience to check the iron before applying it to expensive (or any) fabric. I can add a new lesson here, don't test directly on the new ironing board cover, a folded, inexpensive cotton dish towel it cheaper to replace. For Shannon, she's a 'righty,' so I monogram on the left side for her. For Lynn, she's a lefty, so her monograms go on the right. 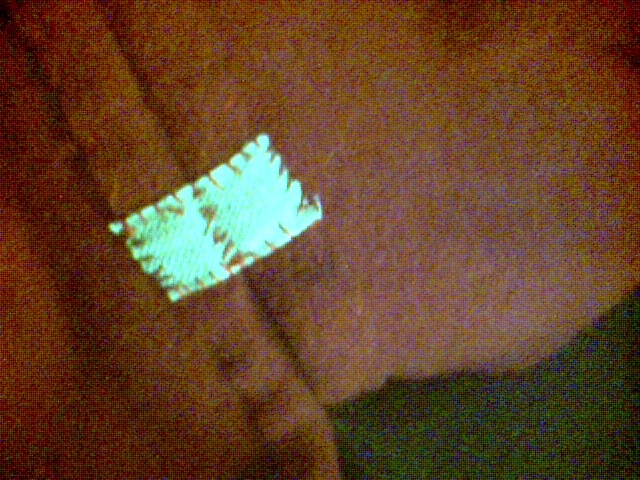 I do that to minimize the wear on the embroidery. 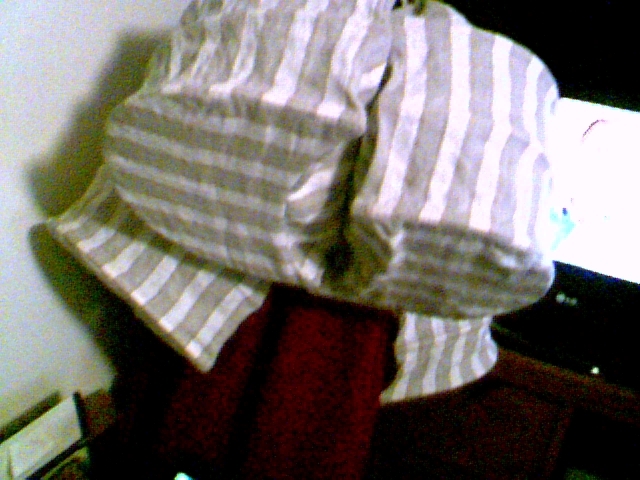 Desperately in need of a good pressing, but I still need to replace the iron. 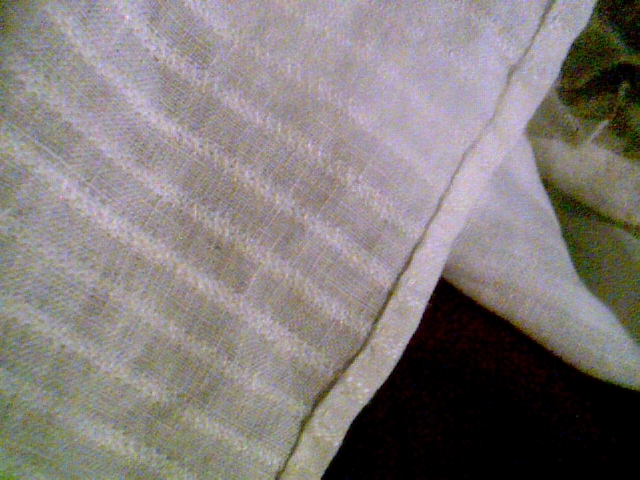 Fabric: 1 yard 100% linen, 62" inch wide, ivory on ivory stripe formed, in the weft, by four medium threads (3/16") alternating with 12 finer threads (5/16"), weft threads are all fine. The ground is tabby/evenweave and the stripes are woven 3-1 (1st course), 1-1-2 (2nd), 1-3 (3rd) and 2-1-1 (4th). 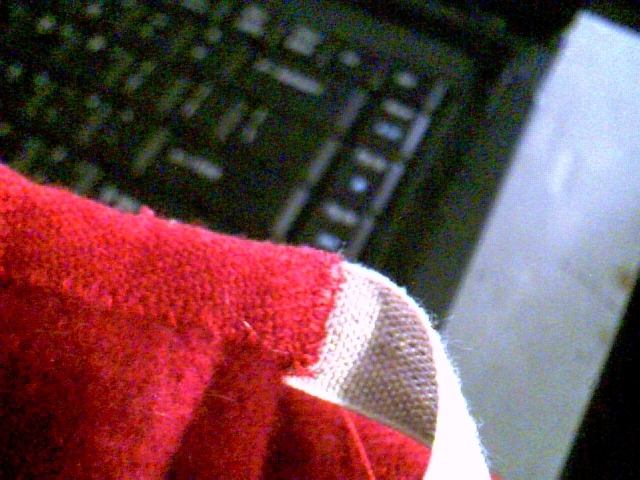 Usually stripes were woven in the weft, as it was easier to keep them even. Textural stripes like these were almost exclusively woven in the weft, all the work being done during dressing the loom and threading the heddles. This weave in particular would be easily accomplished with an easy to remember pattern of treadling. Because of all this, I chose to use the fabric with the weft running horizontally rather vertically, as the stripes in aprons generally ran vertically. Pattern: Simple rectangles. After looking at many aprons in period painting, I've drawn the conclusion that the white 'dress' aprons of the 1770s were less full than their 'working' apron counterparts. 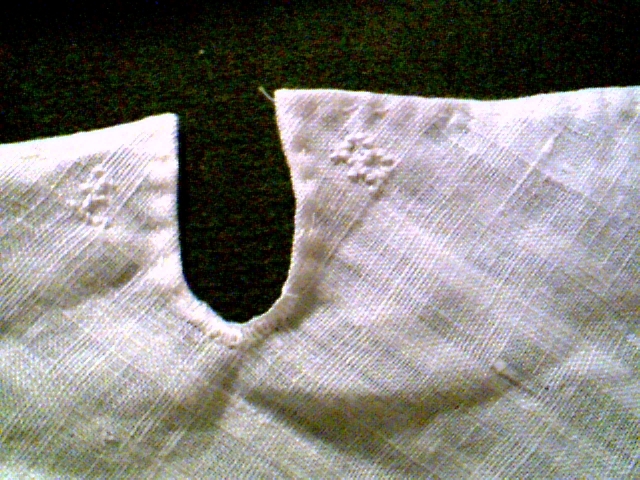 White/dress aprons were most often sheer linen or cotton and gathered on a thick string or fine cord. With this and Lynn and Shannon's slenderness in mind, 36" (a common fabric width in the period) seemed to be a very good width to use, 31" for the unhemmed length works well for the proper length once, hems and top casing are worked. 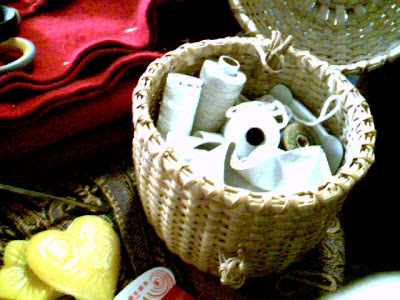 Notions: 60/2 off-white linen thread, used singly for hems, casing and doubled for monograms, 50/3 white linen thread to make cording for apron strings. How historically accurate is it? 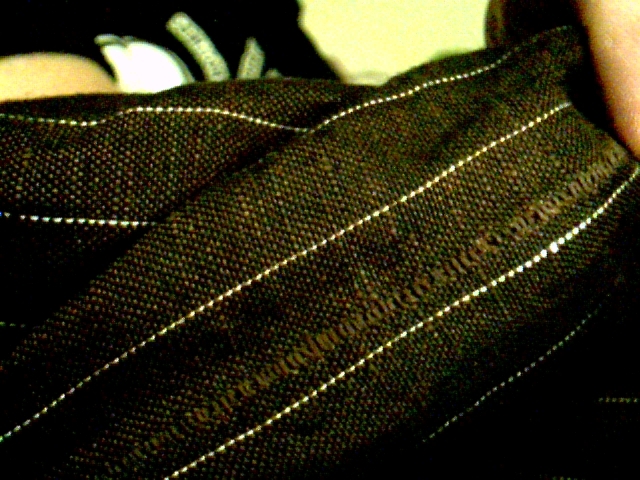 9/10, it would get a 10/10 if the linen had been woven with the stripes in the warp, rather than the weft. Hems and casing are worked in running back-stitch. Monograms are cross-stitched to blend in rather than stand out. I haven't seen any white aprons with colour monograms, but I need to mark each person's linens (a common term for personal items like shifts, aprons, caps) so there are no mix ups or lost items, so I opt for white on white in less visible areas. 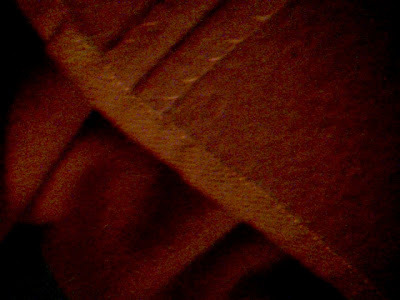 It can be seen in the right light and angle but visually disappears unless you're really looking for it. Alphabet used come from the Coggeshall samplers. Hours to complete: about 8 hours for both, I haven't made the cords for the apron strings yet but I can make 4-strand round braid in my sleep, so I won't count that time. Just so you know I wan't kidding about two pairs of pocket hoops. Fabric: 100% linen (tow and linen), 60" wide, 3/4" unbleached tow stripes are bordered by 1/8" unbleached linen, these stripe groups are alternated with 3/4" half-bleached (off-white) linen stripes. Warp and weft threads are a medium weight. 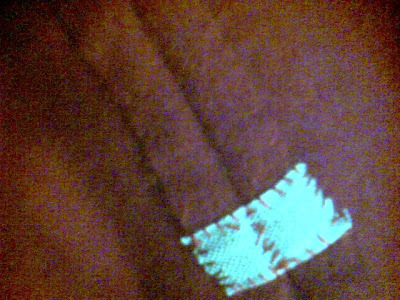 This is a tabby/even-weave fabric. 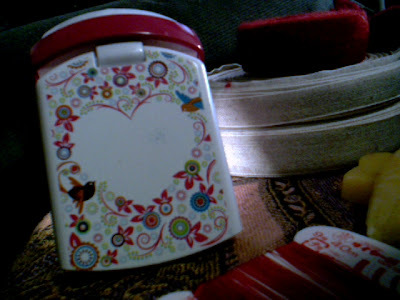 Pattern: After doing a good bit of research, I decided that I could save time pattern drafting by participating in the Pannier Along hosted by thedreamstress.com. Leimomi has done her research and the pattern she presents fits the look and lay of period pocket hoops. Thank you, Leimomi. 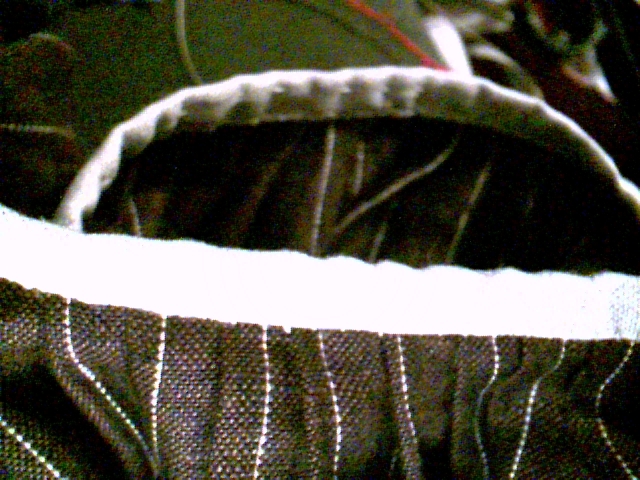 I did add interior pockets for items that need to be easily accessed, rather than fumbled for amidst the many things that will end up being stowed in these pocket hoops by Lynn and Shannon. I wasn't able to find direct documentation for the inside pockets, but I'm going with the "it makes so much sense that some woman, somewhere must have done this" reasoning. The monograms are from the alphabet used in the Coggeshall samplers. 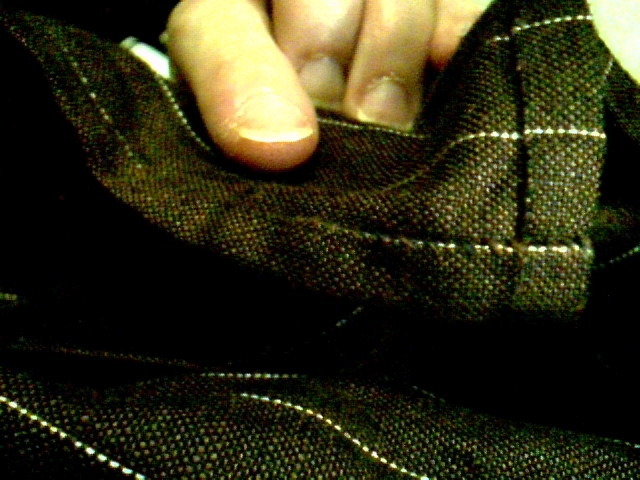 I'll give these an 8/10 for accuracy, since I can't document the inside pockets. Hours to complete: I've completely lost count, but way too many, in large part because: the telly is always on, the computer is so tempting, research on future projects is just too alluring, and my boyfriend and son are often demanding my full, or at least partial attention, the dog needs to be walked, the cat wants to be fed (AGAIN) or I need: to use the necessary, exercise, food or tea/coffee, etc. In other words I have attention deficit disorder and try to do too many things at one time. 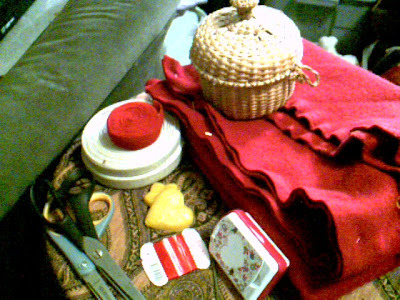 It also took longer than it normally would because I put an interior pocket into each pocket hoop, for smaller, more easily misplaced items. First worn: April 20, 2013, at the Nathanael Greene Homestead, Coventry, RI. 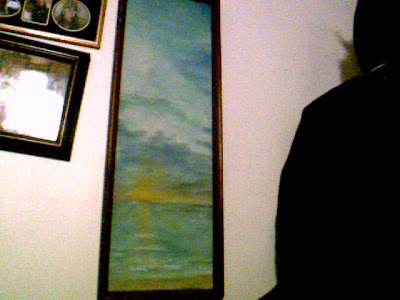 You may have noticed the corner of this painting in a few photos. My mom painted it when I was little and it's mine now. The view is of sunrise on the beach that we lived up the hill from. Most mornings, this was the view I had at breakfast. Even though this is the Sakonnet River, it is saltwater and the current changes with the tides. Rhode Island is known as "the Ocean State" and it really lives up to the name. I've been getting some more work done on the 1770s panier/pocket hoops. I got the hoop casings done on the third pocket and am working on the fourth. I pulled out the monogram on the first pocket hoop and restitched it with the red silk thread, using the alphabet on the Eliza and Esther Coggeshall samplers. 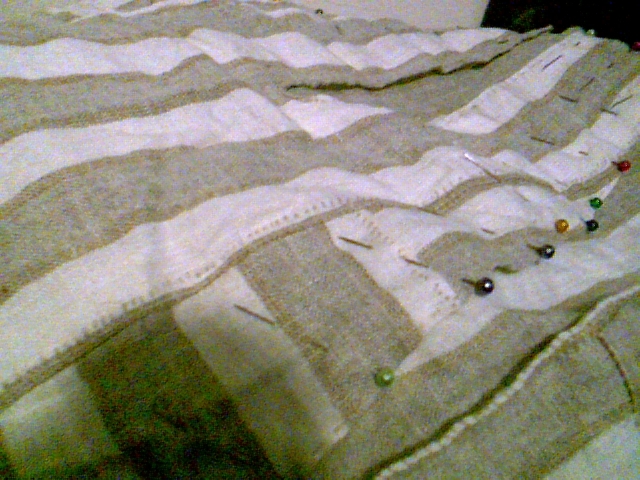 I had already finished prepping the interior pockets (piecing one pocket, hemming the pockets, button hole stitching the bottom of the slits,and turning under and basting the edges of the pockets), on Sunday night. I got one of the interior pockets sewn in place and will finish the other two tonight. I just realized that I put the monogram on the wrong part of one of Lynn's pocket hoops, so I'll have to pull it back out and redo it on the right part. 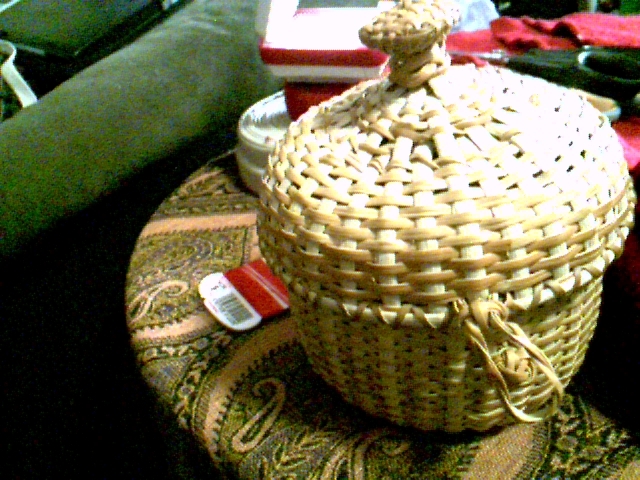 This is the inside back of the panier, the monogram is supposed to be on the front. 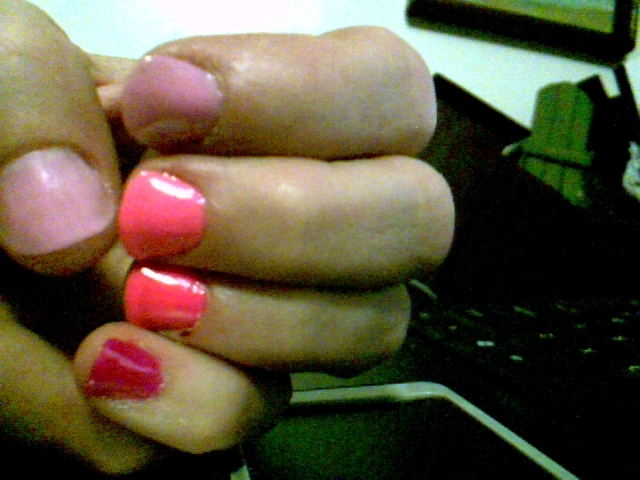 I did take a break last night to varnish my nails. I've been looking at a lot of great designs for nails and decided to go for a shading scheme. Unfortunately, the set I bought that was supposed to simplify things ended up not having an even grading of color. It was still fun though. I got three other color schemes, brown, purple and teal/aqua, I hope they grade better. Pretty nails and happy stitching, what could be better? Keep calm and stitch on! Sorry this is so late. I had some technical difficulties. 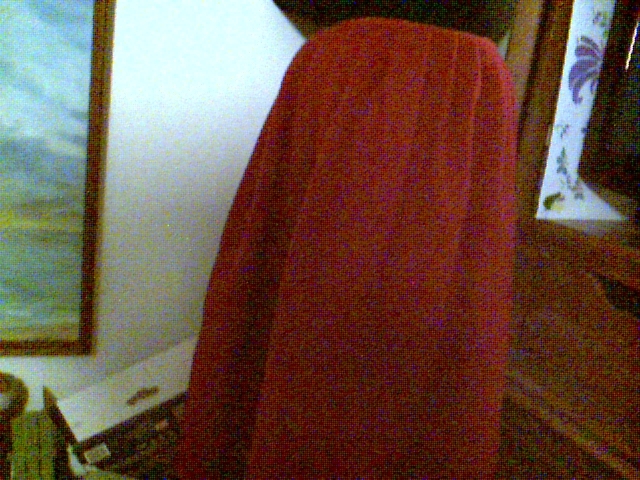 After reviewing my research, I decided to change the waist of the apron. Aprons with casings and drawstrings were predominantly white and dressy. Earlier in the 18th Century colored silk aprons with embroidery were popular. By the 1770s, embroidered and dressier aprons were made from sheer linens and cottons. 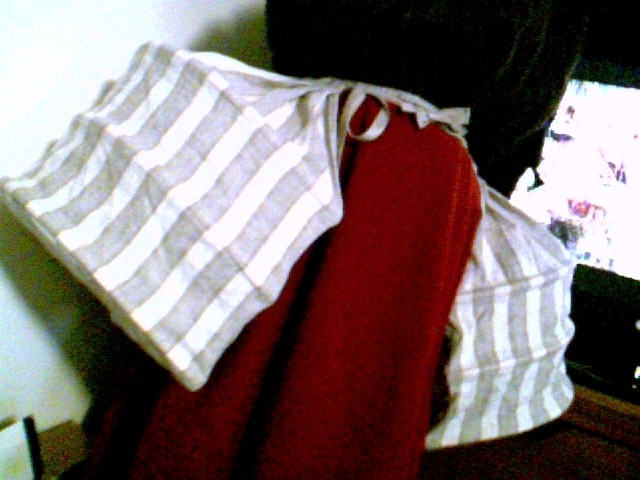 Work aprons were most often made of linen or wool, and were frequently made in dark colors, either in solids, checks or stripes. Work aprons were usually gathered or pleated onto a self-fabric or tape waistband. 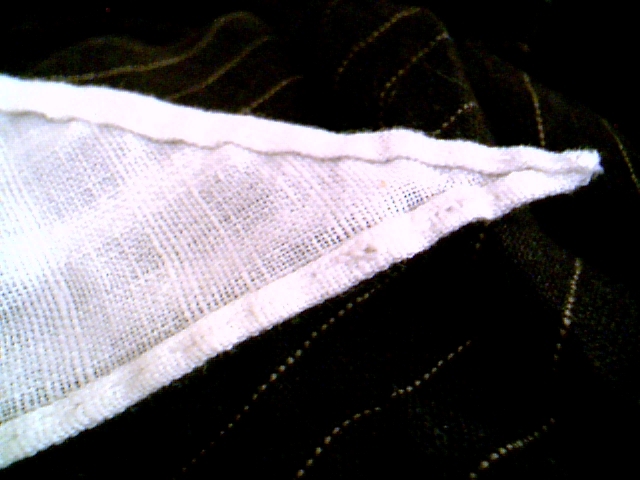 Narrow linen, tow, cotton or wool tapes were sewn to each end of the waistband as ties. Ties were long enough to wrap around the back and tie in front (or to the side of center, so there would be no strange bump at center front). There is some evidence for prints, but I can't say how common they were for the middle and working classes. 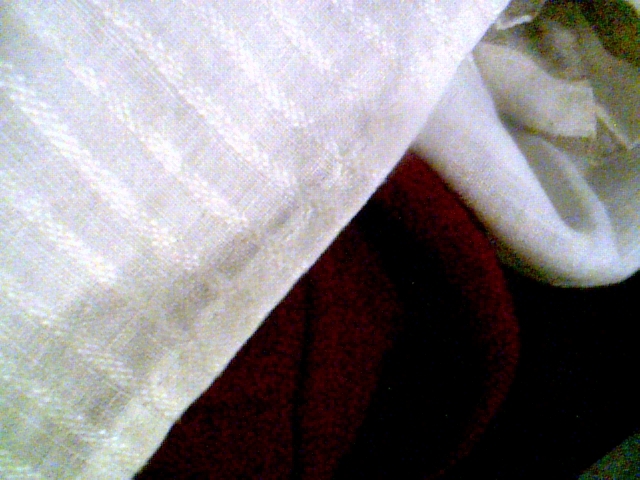 As my brother's family reenacts the American Revolution, I chose to use linen in a dark brown with fine white stripe. 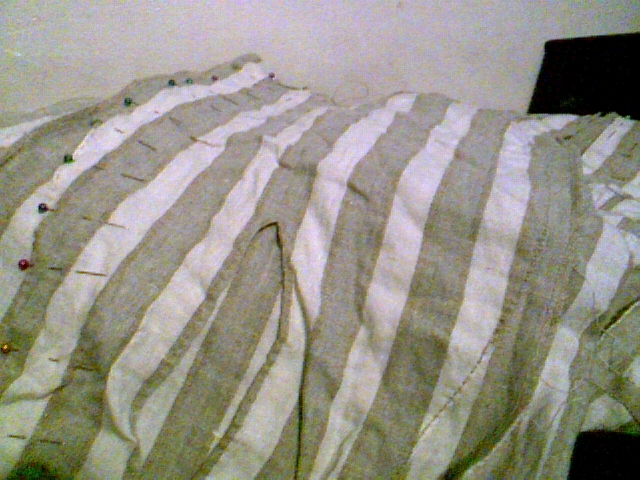 I also chose to pleat and bind the waist with 3/4" linen tape with 1/2" linen tape ties. I made the ties with one longer than the other, to ensure that my sister-in-law will tie them off-center. 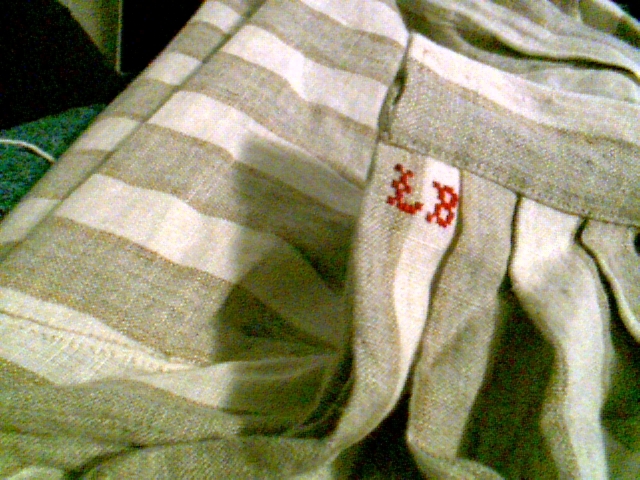 I chose to monogram the apron with Lynn's initials using a cross-stitch alphabet used in the Esther Coggeshall sampler, dated 1774. These letters remain the same in a sampler, ca. 1792, done by Martha Coggeshall. The first sampler is from the needlework school in Newport, RI and the second is from the school in Bristol, RI. There was also a needlework school in Providence, RI. Since we live in RI and are members of the 2nd RI Regiment, it makes sense to use these particular cross-stitch alphabets for marking our clothing. Esther’s sampler is a little different than most Newport samplers but the sky is worked entirely in queen stitch and is identical in colouring and style to the one worked by her half sister Eliza. Esther was born on January 3, 1764 and was the fifth child of Billings Coggeshall and his first wife May Collin. She was eleven years old when she stitched her sampler. 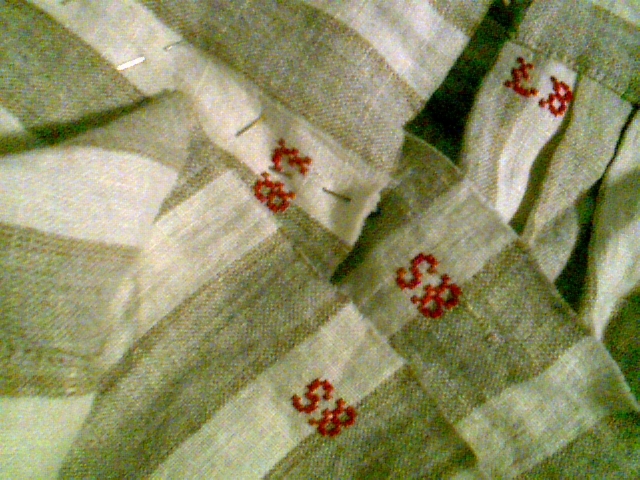 Stitches used in the sampler are queen, cross, cross over one, tent, long armed cross and stem stitch. Some freehand stitching. Kits to reproduce Esther's sampler are available here. Eliza's sampler was sold by Sothebys. Martha Coggeshall (nicknamed Patty) was the third of five daughters born to William (1719-1796) and Margaret Munro (1744-1809) Coggeshall of Bristol, RI. Both Patty and her sister Polly are thought to have attended a school run by Anne Bowman Usher (1723-1793), which was in existence from about 1774 to 1793. Highly respected, the school attracted day students from properous Bristol families, as well as children of the wealthiest Providence families, who were sent to board with the Ushers. Samplers made at Mrs. Usher's school can be identified by distinctive black backgrounds, the figure of a musician playing a flute, and a long-tailed bird in flight. Martha's sampler is in the collection at the Met Museum. I first spotted these samplers when doing some research for Coggeshall Farm Museum. I haven't been able to establish with absolute certainty where either girl lived (besides RI, although, if I remember right, that at least on of them hailed from Little Compton, RI). I also haven't established if they were related to each other, or the Coggeshall family that lived at the farm around 1825. There were quite a few Coggeshalls in RI during the 1700s, and even when the first US census was taken in 1790, only men were listed by name (women were only counted as a category, with female children). The farm was owned by the Colt family and was always a tenant farm, hence why the museum was named after the Coggeshalls, rather than the Colts. There is a blue and white checked apron in a book of extent pieces from the period. The book is by either Sharon Burston or Linda Baumgartner, I can't remember which off the top of my head (This was one of the technical difficulties; I can't locate my copies of either book.). 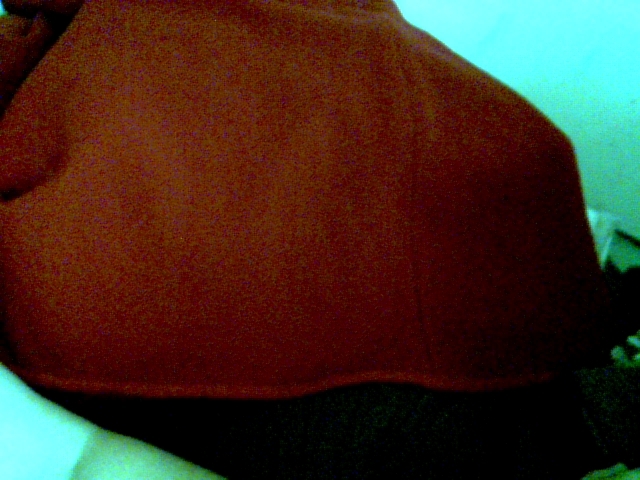 The apron has a two initial monogram, near the upper edge of the apron, worked in red. I used two strands of the red silk thread, left over from the wool petticoat project, to work the monogram. I placed it on the right hand edge of the apron because Lynn is left-handed and the threads should get less wear on that side. I also arranged the apron strings so that the shorter tie was on the left, which means that after crossing in the back, the apron will tie toward the right side. I wanted to avoid lumps in the center front and I've noticed that aprons tied to the side away from one's handedness are less apt to come untied through friction caused by normal work habits. I went with a long length and a fair amount of fullness, for full coverage during work activities, as is fitting to the period and setting. I cut the fabric into panels and worked a fine rolled hem on the edges that would be joined together, then whipped them together. 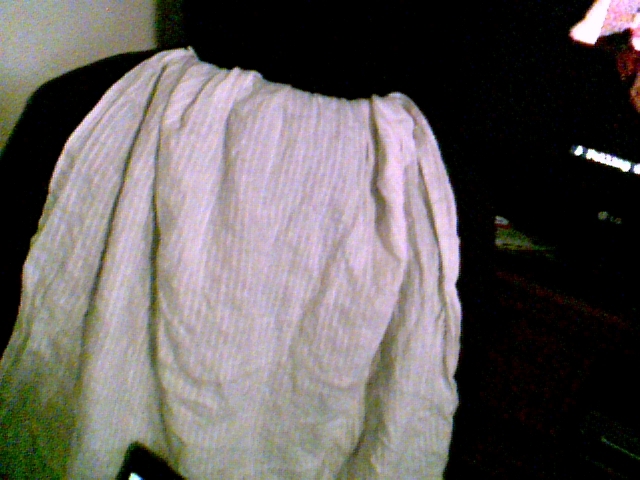 I did this to mimic how a wide apron would be made from the narrower widths typical of the period. I based the width on what I could have woven on my loom. 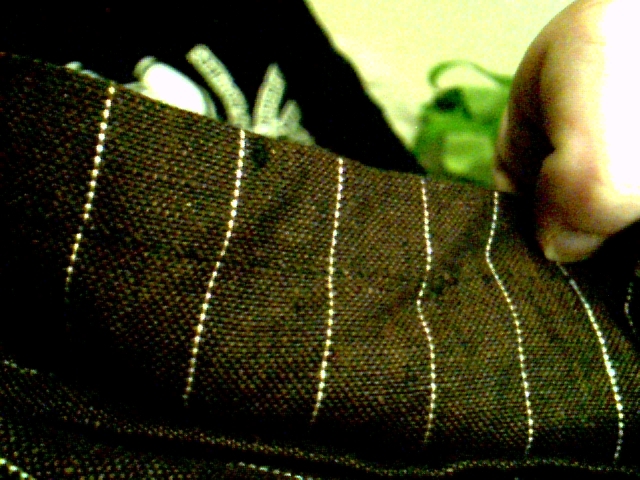 You can probably make out the pocket slit just to the rear of the ties. I am so happy to have this one done and all the bugs worked out. 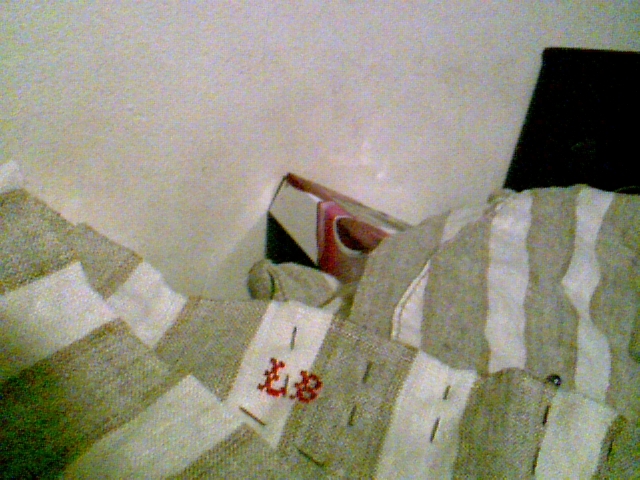 I have more of this linen to make another apron, this one for my niece, Shannon. I meant to finally varnish my nails in stripes (I haven't bitten them to the quick in two weeks and, amazingly enough, I haven't broken any either. I hope I didn't just jinx myself.) but that was another technical problem. I couldn't even find my clear varnish, nevermind any colours. Oh well! Notions: 35/2 unbleached linen and red silk quilting thread, 1/2" and 3/4" linen tapes, beeswax (all purchased from www.wmboothdraper.com and in my supplies). Linen threads for seaming and hemming were pulled from the warp and weft and used together, waxed. How historically accurate is it? I'd give it a 9/10. I'd give it a 10/10 if the fabric had had good selvedges and a proper period width without cutting. I did mimic the construction method used for narrower goods. The color and stripes are documented for working class, and the monogram is also accurate for the period and class. Hours to complete: Way too many. Quite a few hours were chewed up by hunting for thimbles, scissors and threads (Gizzy was far too busy whenever I got up, but it least she got some exercise.) and more were eaten up with roll-hemming the joining edges and whipping them together. If you only count the time for the rest of the construction (hems, tapes and monogram [leaving out the movie and research time]), I probably spent a total of 8 hours. First worn: Lynn will wear it on April 20, 2013, at the Nathanael Greene Homestead, in Coventry, RI. Have a sweet sleep and dream of fantastic sewing to come. Here's a total blast from the past. While I was looking through vintage patterns on the internet, looking for beach wear for the next HSF challenge, I stumbled upon this one. 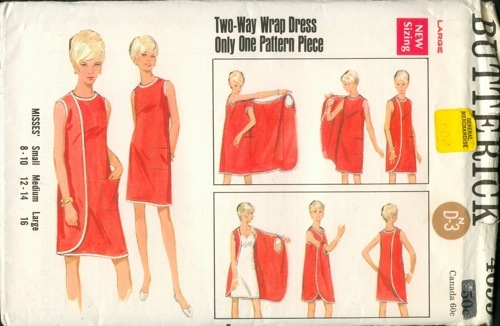 I would be willing to bet that Mum's pattern actually came from Simplicity or McCalls, but she used this with a squared lower corner and no pocket. She made matching Mom and daughters Easter outfits, in a heathered pink fabric (unknown fiber content) with a pink and peach trim,. 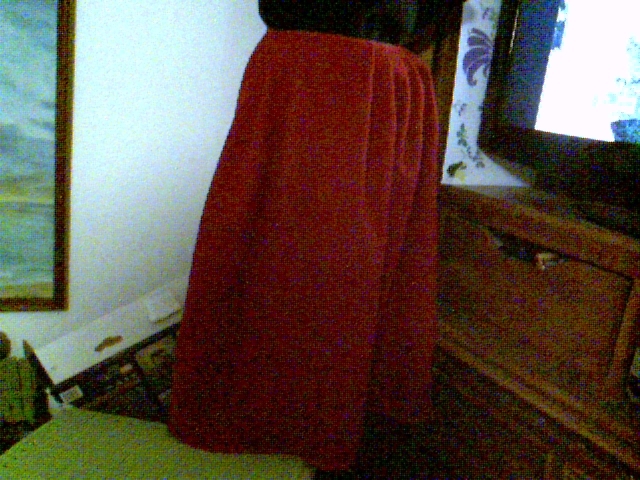 My sister and I also got matching capes, made from a lightweight pale grey wool, with white pique Peter Pan collars edged with a heavy white lace. With our white straw hats, basket purses and white patent leather shoes, we were quite cute. My brothers were quite well-dressed too, but at the moment I can't remember what they were wearing. There are pictures of us wearing them floating around somewhere. One day when I find the photos, I'll scan them and post them. 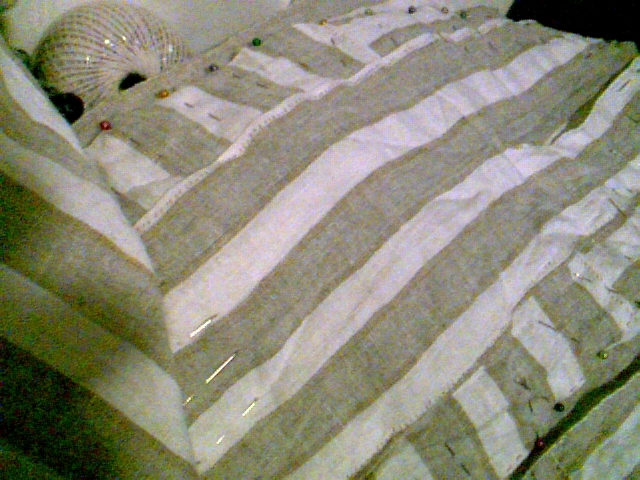 The challenge is stripes and my entry is an apron for my sister-in-law, Lynn. Without further ado, here it is. 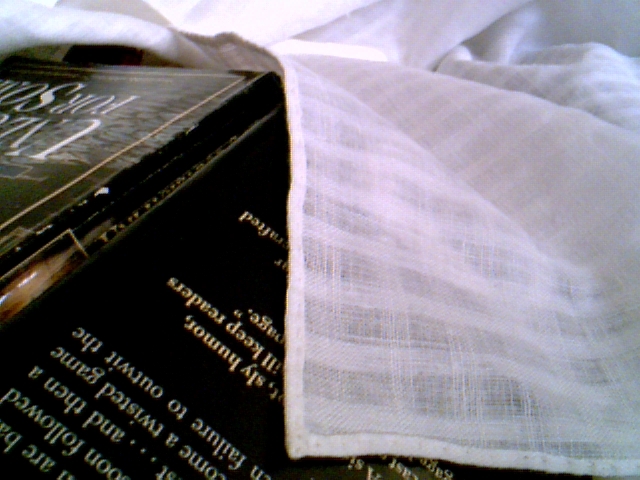 The fabric is 100% linen with 5/8th inch wide stripes separated by single white threads. The stripes are in the warp, which is predominantly black. The weft is brown. 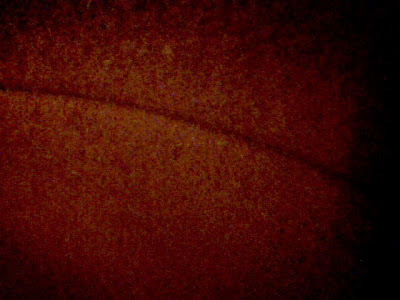 The combination forms a very dark brown with pinstripes of white. 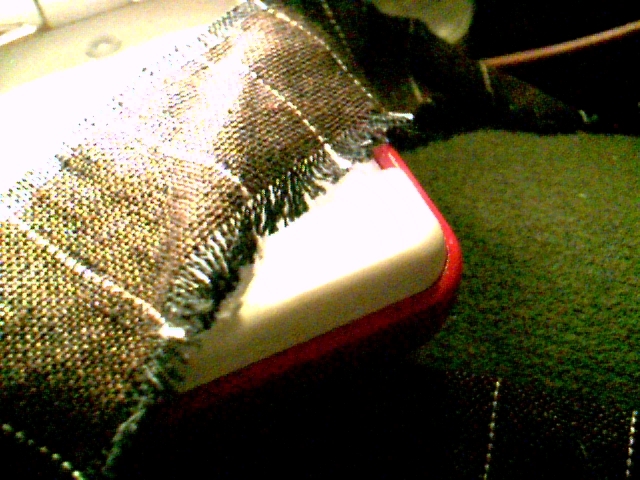 I pulled threads from both the warp and weft, waxed them heavily and used them for sewing. 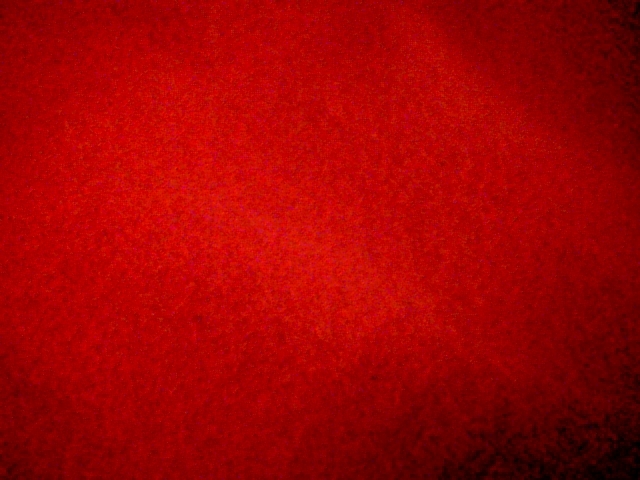 The fabric is from William Booth Draper, and is 59" wide at $14.00/yard. I cut the fabric into 3 equal panels, at 19" each. 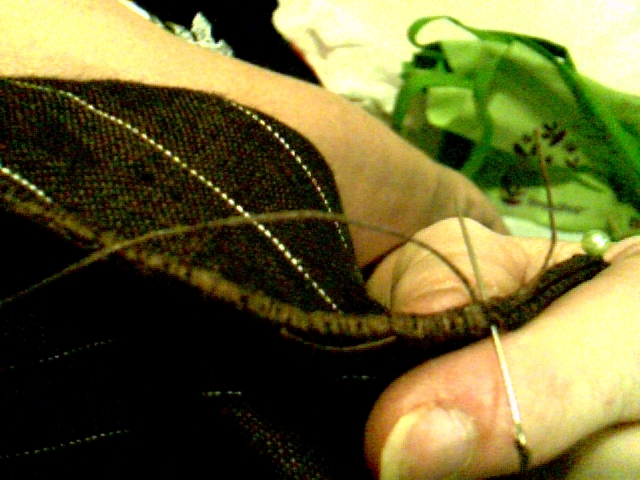 I worked a fine rolled hem along each long edge, using 1 strand of brown thread. 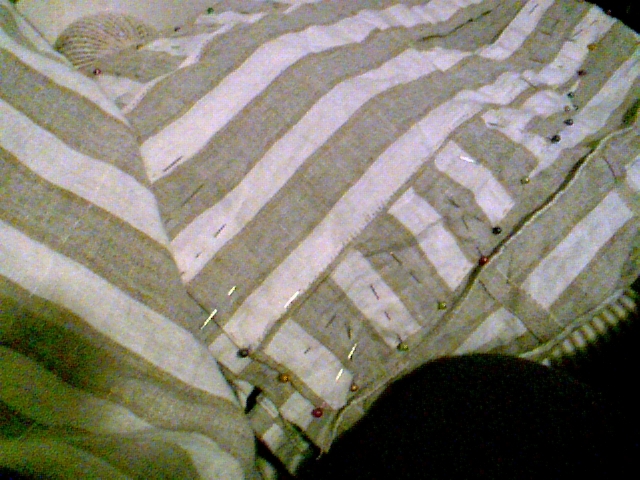 I then whipped the panels together using doubled strands of brown thread, biting in only about three threads worth. 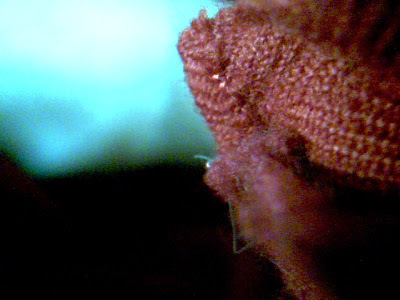 Hems were worked by turning under 3/8th inch and turning under again. 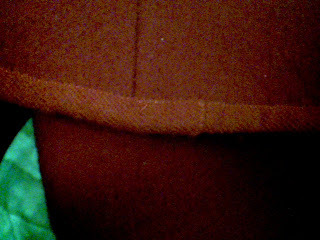 Bottom hem was worked first, and then the side hems carried all the way to bottom edge (NOT mitered) Hems were closely whipped using one strand each of brown and black threads. Casing for drawstring was made at the top by turning under 1/8th inh and then 5/8th inch. 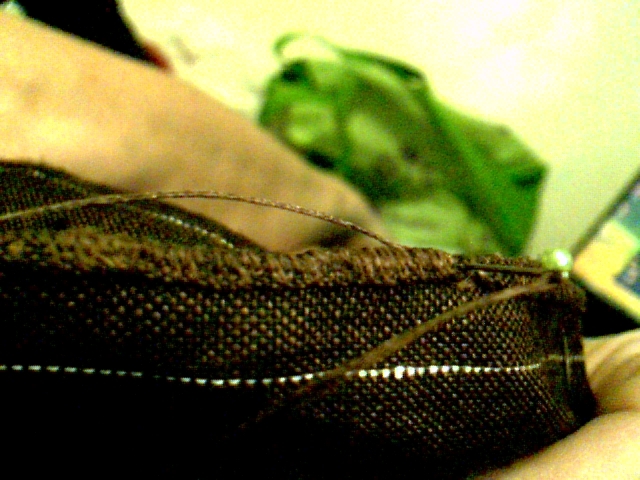 Casing was whipped down using one strand each of brown and black threads. 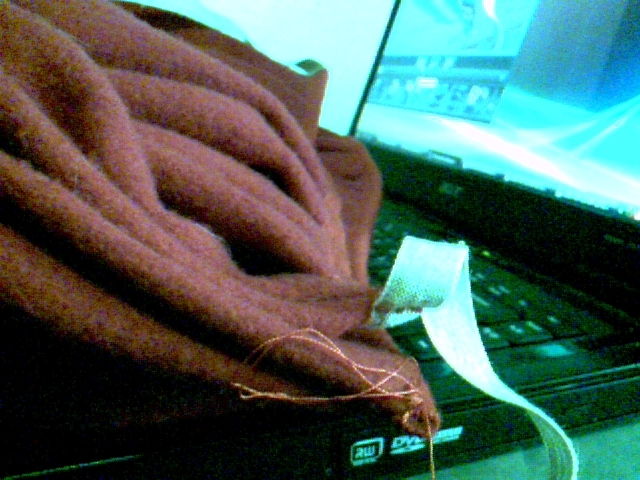 I still need to hem the ends of the drawstring/tape and thread it through the casing. There's also still a little more stitching to do on the hems and stitch the monogram, but I wanted to get this up for now. I should be finished tomorrow morning, and then I'll post the HSF criteria along with the research and reasoning behind making the narrower panels, rather than using the linen at the full width. I actually started this apron in plenty of time to make the deadline, but I got side-tracked by the Zelda project for Liam. Then I got going again on the shifts, before I realized that the challenge was almost due. We make plans and God laughs. starting with the sewing basket I made a couple of years ago at Coggeshall Farm Museum's Harvest Fair. A good selection of linen and silk threads, from William Booth Draper of Racine, WI, USA. My small OTT light (purchased at Michael's). It clips on and is great for close work and lighting for photos. 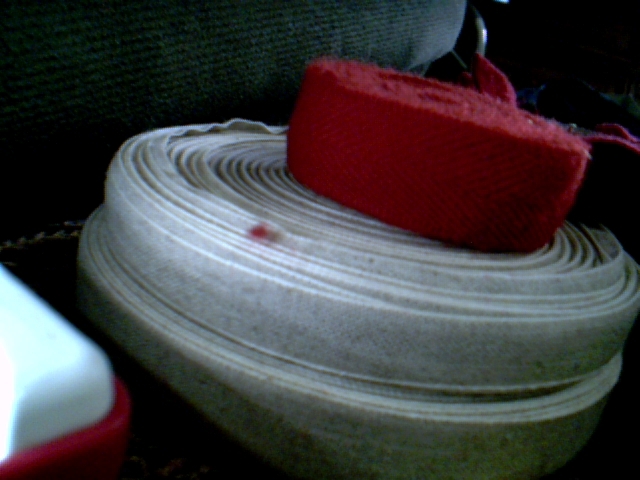 1/2" unbleached linen tape (for waist ties and reinforcing the bottoms of pocket slits) and 7/8" red wool twill tape (for binding hems and waists). 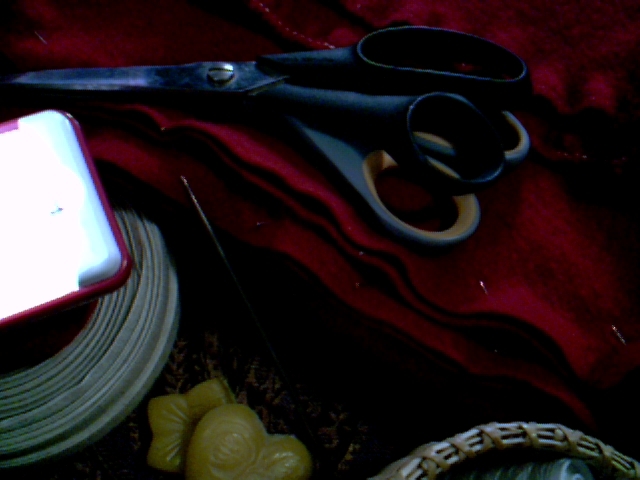 All set to sew and photograph. Can't forget the pins. 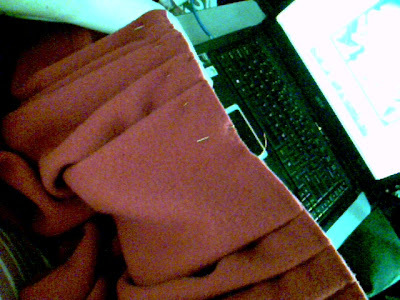 The arm of the recliner is my favorite pin cushion, since Gizzy likes to knock everything onto the floor. 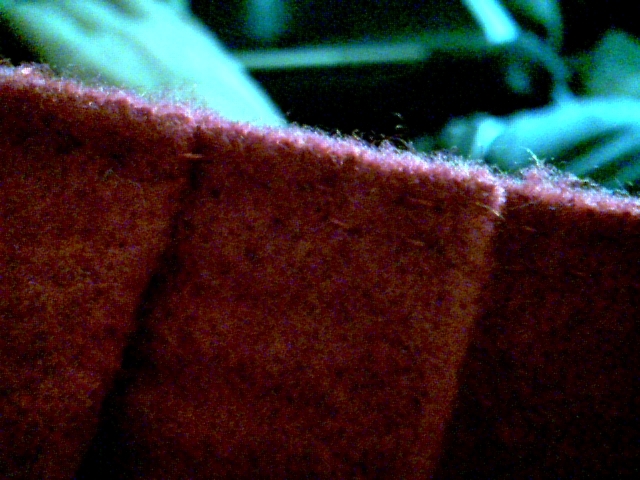 This is as true to the color of the wool flannel as I can capture. It's really got a little more blue to the color. 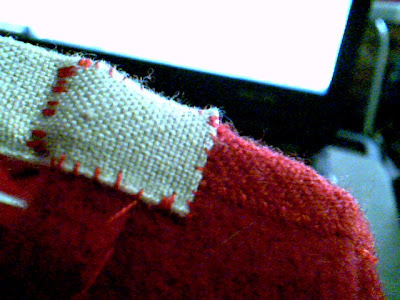 Hem bound with wool twill tape and whipped in place. 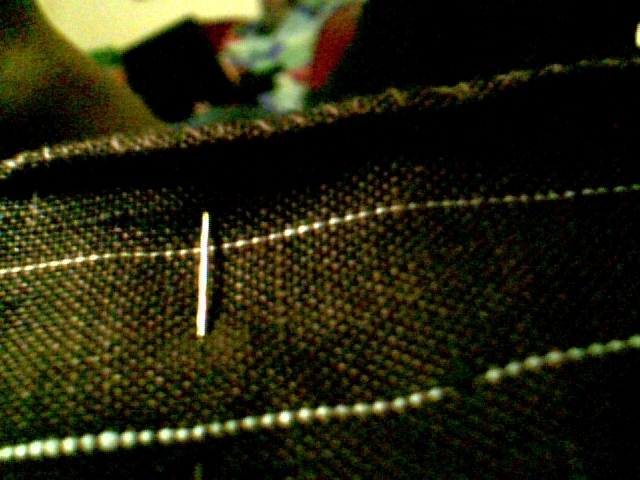 Pin pleats to gather in fullness to waist. 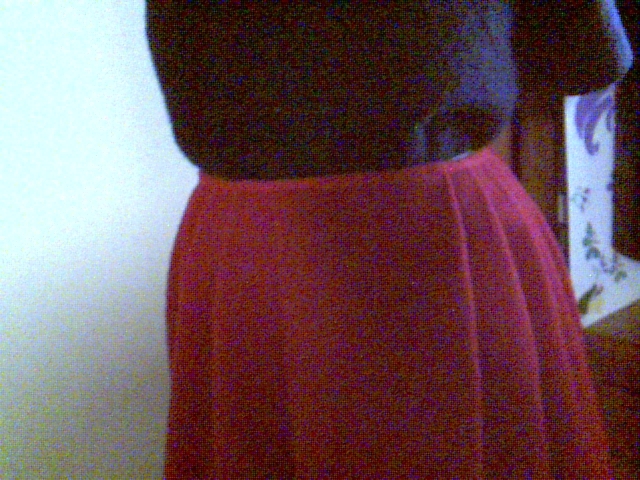 Waist has a 4" flat space at center front and no space at center back. 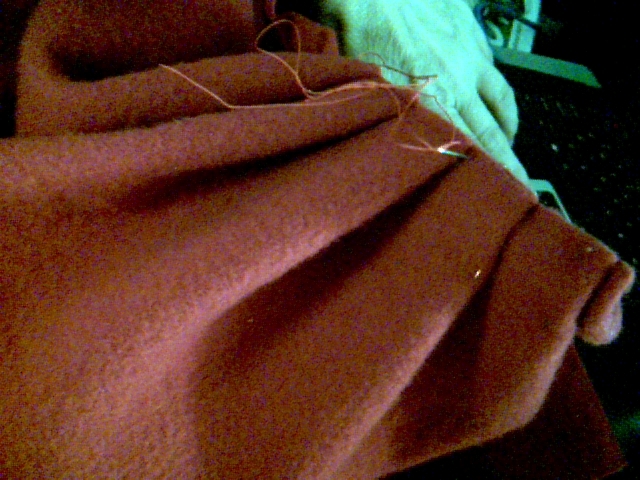 Stitch double lines of tight running stitch to hold pleats in place. 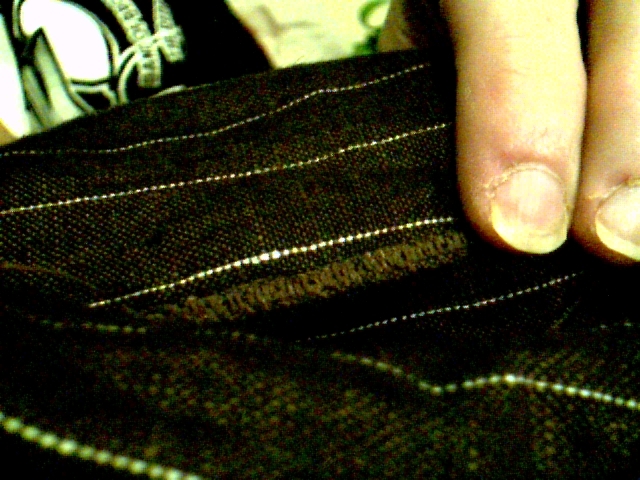 Bind waistbands with wool twill tape. 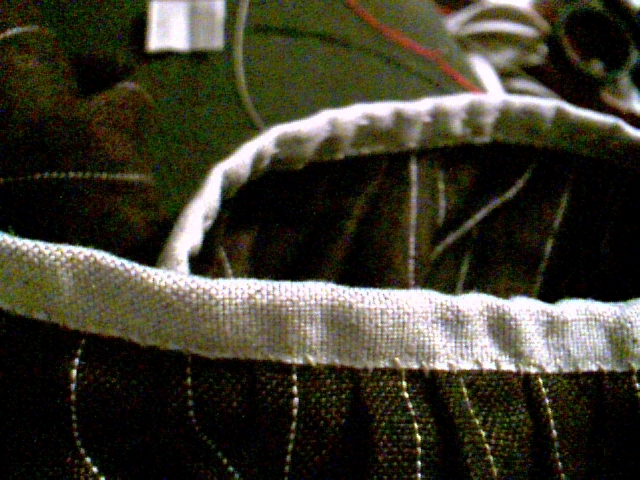 Turn under end of linen tape ties and whip into position at each end of waistbands. I'm sorry the last photos are so out of focus. 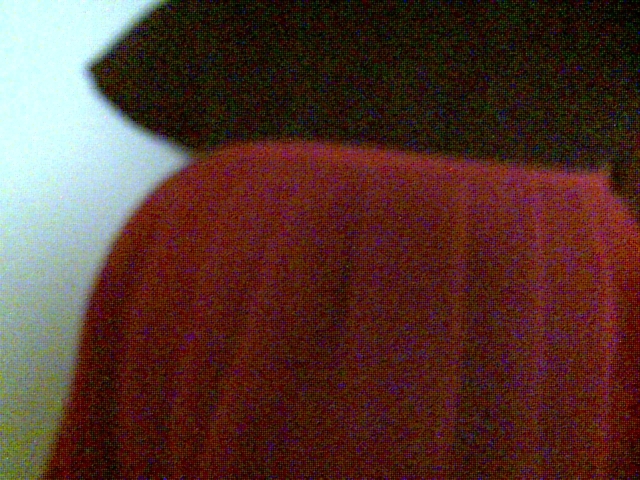 I'm working with a really cheap web camera, and I can only get sharp focus with objects that are no more than a foot away. Pattern: Simple rectangles, full width of the cloth, cut into 4 lengths of 1 1/4 yards each. Year: spans the entire period of the American Revolution. How historically accurate is it? I'd say this is as close to 100% accurate as modern materials will allow. 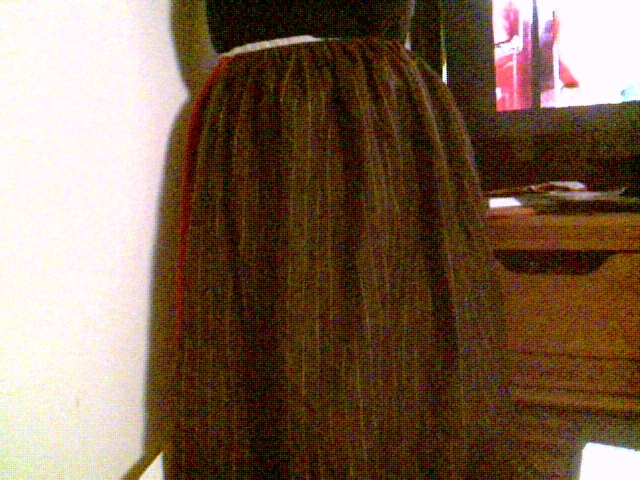 Both skirts are entirely hand-sewn, using period construction methods. Red wool petticoats, as well as red wool cloaks, were extremely popular throughout the period of the American Revolution, especially in the rural areas of New England. (see: "Had on and Took with Her"by Sue Huesken and Karen Mullian and "Wenches, Wives and Servant Girls" by Don Hagist ). Since my family reenacts with the 2nd RI Regiment, this was something I've wanted to do for a very long time. The length of these petticoats is above the ankles, as popular length for the working classes. Longer petticoats would have impeded the work. Hours to complete: It's hard to say. I work at home and the interruptions and distractions are many. So far I have been sewing since Tuesday and the second petticoat is nearly finished, but is on hold until I can order the additional quilting silk to finish. First worn: At The School of the Soldier, April 20-21, 2013, New Windsor Cantonment, New Windsor, NY, USA. 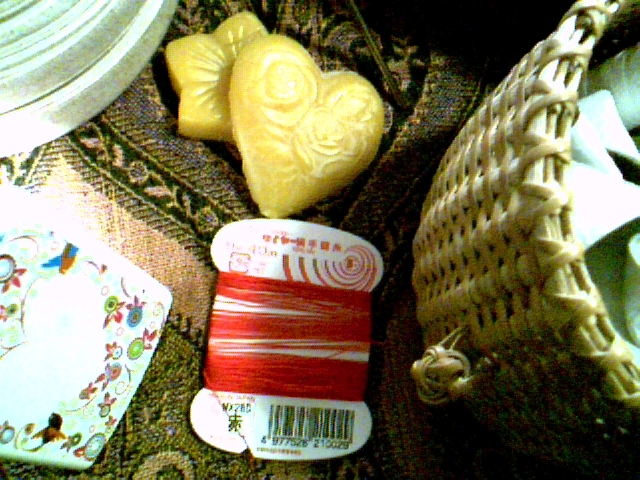 very small amount of 35/2 unbleached linen thread, to finish the ends of the ties - $0, bee's wax cake to wax threads - $0, both are always on hand in my sewing basket. Total: $123.30 for 2 petticoats, $61.65 each.